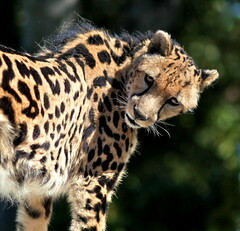 King cheetah: Where to see one? King cheetahs are not so exceptional that you can’t see them in zoos (but you may have to travel to meet them). I wondered if it was possible to list of zoos of the world which have at least one of them in exhibition. DeWildt Cheetah Research Centre, in South Africa. Kgosi: animal ambassador from the Wild Cat Education & Conservation Fund in Occidental, California (USA). Many king cheetahs are said to be present in some public institutions (and in private ownership) in the Arab Peninsula, where most of the king cheetahs are probably present (if not always easy to view). Of course, such a list cannot be permanently up-to-date without the help of the readers of YLoveBigCats. Please, feel free to comment to add new locations (or tell when the last king cheetah of a zoo unfortunately died, as it happens sometimes).